The first of Cromer's stations was built for the East Norfolk Railway line, which arrived in 1877. It was eventually known as Cromer High - it was only when Cromer Beach was opened 10 years later that it was necessary to distinguish between the two stations but the 'High' was not formally added until 1948. A map exists - see right - which indicates that at one point the East Norfolk Railway considered running a line to Aylsham that then ran on to Cromer, with a separate line running form Norwich to North Walsham, but that was not the route eventually chosen. Services on the line were run by the Great Eastern Railway from the outset and it was not long before the Great Eastern Railway owned the company completely. It is likely that for 1883 they were able to encourage, perhaps by providing a free ticket, the Daily Telegraph's travel writer to make his journey to Cromer, the result of which was Clement Scott's series of articles on 'Poppyland' The substantial development of the area then raced ahead, no doubt as the company and its shareholders wished. 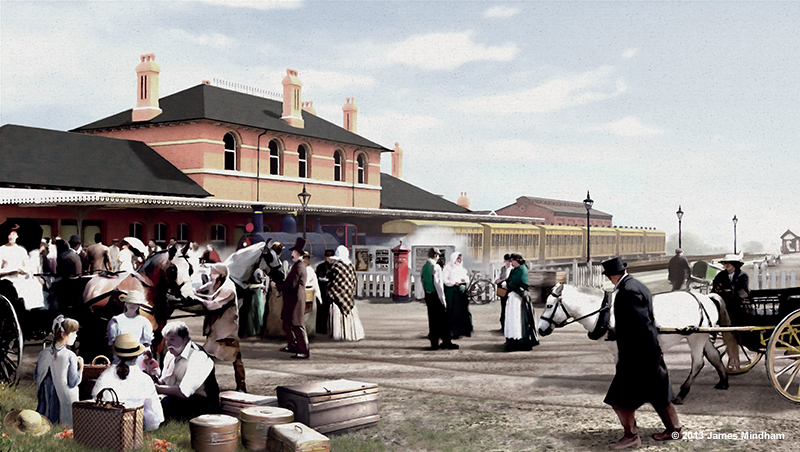 Below is an outline 3D model of the station in 1887. It is running in Google Earth within your browser, so you can zoom in, tilt and go round the station with the usual Google Earth controls. Zoom in towards the building and you can use 'Ctrl' and your arrow keys and 'Shift' and your arrow keys to change angles and direction. You can click on the option shown to overlay the 1887 OS map. NOTE: The Google Earth functionality is available in the Firefox, Chrome and Opera browsers; it does not currently seem to function within Microsoft Explorer 11. The model is a large file and make take a few seconds to download. Graphic artist James Mindham, who created the 3D model, has also created a picture from the 3D model, shown below. A high quality print of this picture can be purchased from the Poppyland Publishing digital prints page.